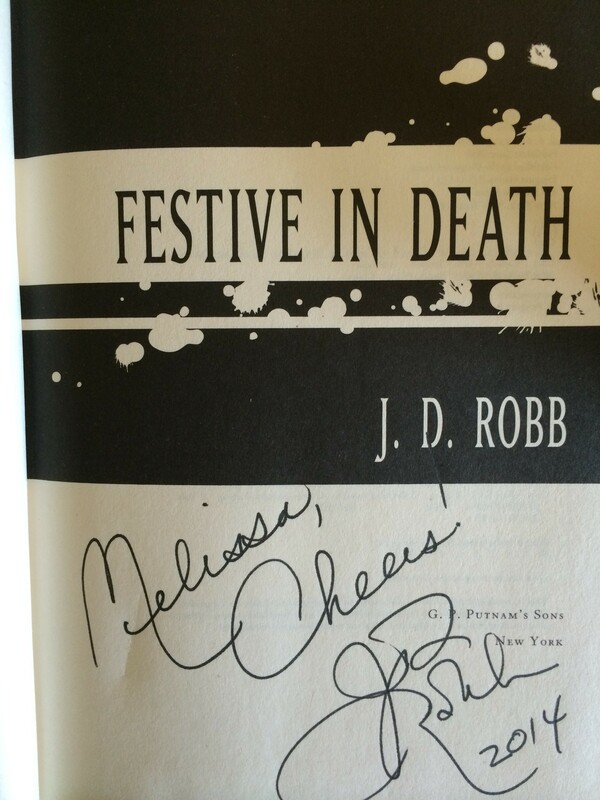 I recommend “Festive In Death”, by J.D. Robb. Trina needs to tag Eve in this story when a friend finds herself in a situation that demands the services of a murder cop. J.D. 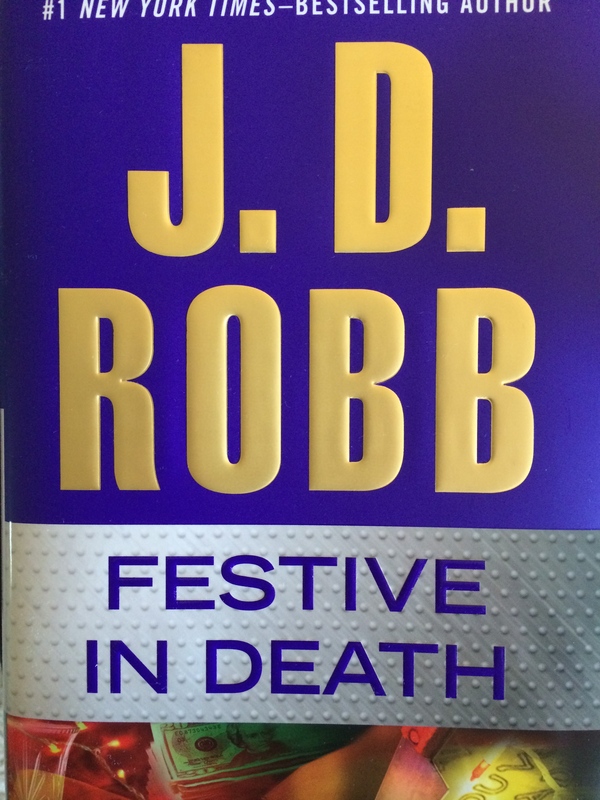 Robb delivers in this fresh In Death tale of double crossing lovers and a conniving personal trainer. I didn’t figure out who did the murder until the very end. The journey to finding the murderer is brilliantly interwoven with Christmas shopping, and preparing for the annual gala thrown at Lieutenant Dallas and Roarke palatial home. J.D. Robb is an artist painting a word picture with fantastic dialog and narration that is completely engrossing. The world and characters that make up the In Death series is maintained and consistent with each new release. Festive In Death develops Trina in a new way without taking away from the core players that all fans love so well. Susan Ericksen, In Death narrator in the audiobooks, does an excellent job bringing each character to life with her voice inflection and flowing delivery of the script. I purchased my copy with my iPhone at the iTunes store. Listening to the reading is like attending a play. Every move, feeling and expression is represented during the telling. I appreciate both the hard copy and the audiobook each have their own gifts to bring to the story and reader. Thank you J.D. Robb for writing another best seller that stays true to the beautiful characters you have created over the years. I also appreciate the signed copy – you know how to treat your fans and I’m happy to be one. Turn The Page Bookstore Cafe http://ttpbooks.com/ is also something I’m grateful for – offering book signings both on site and virtually. I know it takes a lot of work to track all the orders and get them safely to their destinations. Thanks to one and all. 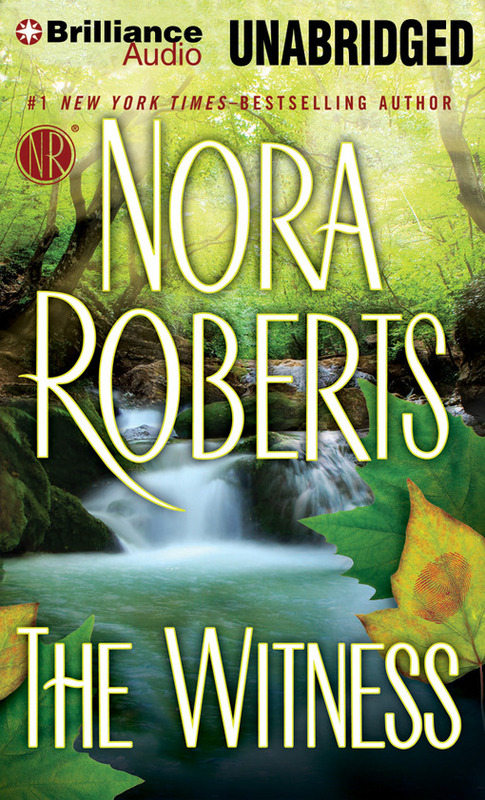 Why read “The Witness” by Nora Roberts? Consider a young girl, Elizabeth, finds out her Mother didn’t give birth to her for love but to make the best out of a sperm donor’s DNA. Elizabeth finds herself at 16 a college student that has never been on a date nor has she ever been shopping with friends. She has an opportunity to have a day shopping with a girl from her old high school and forging fake ID’s for them to go out to a popular club. Elizabeth soon finds herself running for her life. What comes next will change her life in ways she would have never dreamed possible. Will this naive girl survive into womanhood? If so, what sort of life will she have? All this and more will be answered by Nora Roberts as the story unfolds. You’ll discover what happened to Elizabeth, her Mother and the Federal Agents assigned to protect Elizabeth or is it to prosecute? “The Witness,” kept me guessing. It is a snapshot of a girl left on her own with no guidance and the trouble that finds her. A Mother’s love is important and this story shows why on so many levels. The adult Elizabeth finds she still has things to learn about finding and keeping love between a man and a woman too. She has to find the courage and wisdom within herself to pursue the man of her dreams while staying safe from the men from her nightmares. Nora brings all the characters in this book to life from the shy and bookish Elizabeth to the sterile, demanding and unfeeling Mother you’ll find those you love and those you will love to hate in this adventure of the heart. There are very few writers that could bring a character like Elizabeth to life, but Nora Roberts does it beautifully. From the style of Elizabeth’s hair to the experience of wearing her first pair of heals, you will not be disappointed. This is a definite re-read for me. So much detail needs to be savored. If you buy with the second link you can ask to have it signed by the author and its on clearance for $10.00. I also enjoyed the audiobook performance by Julia Whelan. She brings out all the emotions of the characters in her voice tone and reading style. Lovely job, Julia, thank you. What sets “The Ornament” by Zeke Changuris apart making it a must read novel for all ages? This is the journey of a young photojournalist striving to be the best when the woman of his dreams starts working at the same TV news station. The courtship of Amy and Sam is full of all the detail of what goes into being a good news anchor and photojournalist along with all the personal struggles these two face living life. Zeke shows us how a single frame of video captures the emotions of a moment out of time. He brings to sharp focus all that goes into being human from dating, marriage and finding the courage to say what’s in you heart to a woman you’ve loved all your life. “The Ornament” allows us to see inside the TV news profession in a whole new way. Zeke details the ups and downs in a news anchor’s and photojournalist’s personal as well as professional life. The journey takes us to Hagerstown, Maryland to Operation Freedom in Iraq and back to Washington, DC. Zeke Changuris writes from the heart about a profession he loves and how hard it is to find and keep true love. Zeke’s characters are easy to imagine as well as the places they inhabit. Vivid descriptions as only a photographer can capture are brought to life in Zeke’s dialog and narrative. Beautifully and poignantly written. Reading to me is finding something new about the human condition that is both inspiring and helps me see myself a little more clearly. “The Ornament” does this and more. It pulls the emotions out of me. I feel for Sam and I have a better understanding of what a man experiences as he travels through life. Thank you, Zeke Changuris for sharing these beautiful characters with me and all readers that enjoy a story that celebrates living life to the fullest. Keep on writing from the heart, Zeke, you have a gift to not only bring characters to life off the page but to also share the complex emotions that make up each and everyone of us. From Turn the Page Bookstore Cafe at a Nora Roberts sponsored book signing event. I hope you all take a few minutes to check out this book and order from TTPBooks.com a safe and secure way to get books quickly and in great condition all over the world. “The Ornament” is a must read book for our time for all ages. My book reviews are my own. I only strive to help readers find books that I’ve enjoyed and found some new insights into the human condition. Comments are welcomed. I found this book on Twitter when Sheryl Seal (@sherylseal) tweeted the cover art. It is amazingly beautiful. When I found out it is the cover art of a book I knew I had to read it. What’s so special about “Beyond Bridalveil Fall (Dwellers of Ahwahnee)”? It takes us on journey into the spiritual part of our being. Into that part of us that makes us part of the universe. Sheryl also introduces us to the consequences of unharnessed emotion and the price we all pay when we fail to control our thoughts and feelings. “Beyond Bridalveil Fall (Dwellers of Ahwahnee)” shows us why it is so important that we get to know our inner selves. Sheryl delves into what makes us human and unique. She demonstrates how important it is to be straight with ourselves and others. 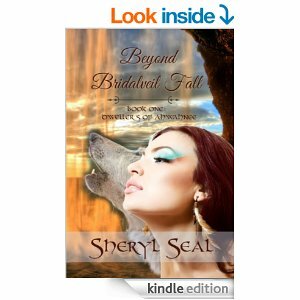 Any young adult to senior citizen (rated G for wholesome family reading) will find “Beyond Bridalveil Fall (Dwellers of Ahwahnee)” engaging and inspiring. Sheryl writes from the heart and pens imagery like the cover art that moves us to try and capture all the beauty that is around us. 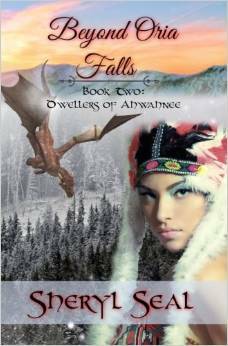 “Beyond Bridalveil Fall (Dwellers of Ahwahnee)” is fantasy that has roots in reality. All that experience life will find moments from Oria journey to womanhood that connect with their soul. Keep on writing Sheryl Seal you have a gift that speaks to the heart. Paper back copies are also available. 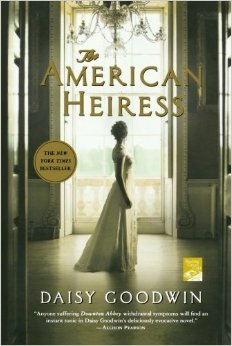 Why do I recommend Daisy Goodwin’s “The American Heiress“? First, the novel is well written with elements of romance but not focusing on the happily ever after concept. Instead Daisy Goodwin provides a fresh look at turn of the twentieth century America and England. Her perspective is a new one for me painting a picture of how truly callous the wealthy are during this era. You’ll learn much about what a British title costs the young Cora Cash. 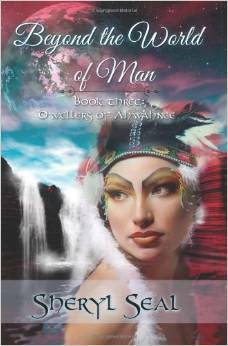 Cora pursues the title to appease her Mother but finds herself drawn to a Duke she meets by chance. I think what brings depth to “The American Heiress,” is the relationship between Cora and her maid, Bertha. As Cora is drawn more and more into the drama of English Aristocracy, Bertha is able to ground her on what’s most important. Bertha’s story is every bit as important to the plot of this excellent tale as Cora’s. There’s also plenty mystery and intrigue as the story unfolds. Daisy Goodwin keeps me guessing until the final chapter. Will Cora be happy? Is Bertha going to be able to keep her position and the love of her life? You won’t find out until the very end, but I can guarantee “The American Heiress” is a page turner that keeps you hooked until the very end. I listened to the audiobook and found Katherine Kellgren’s narration engaging and full of emotion. A very well done production. You can get an audiobook from iTunes or the book or e-book from Amazon at the following links. 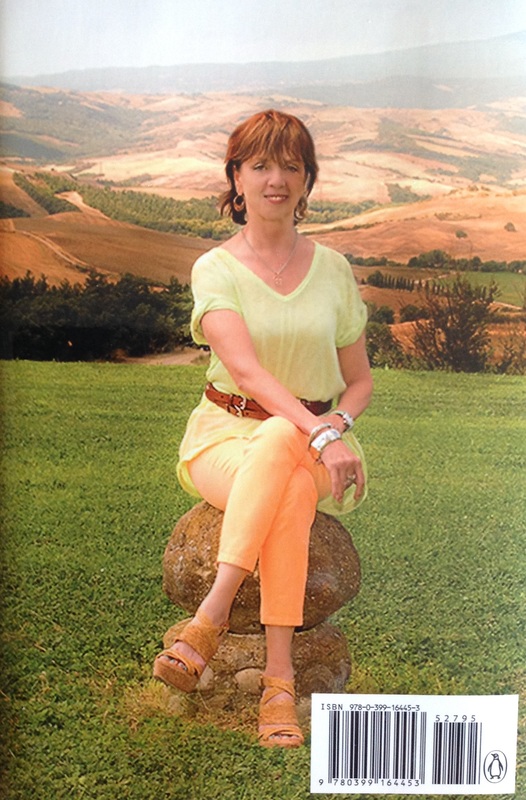 “The Collector,” by Nora Roberts surprises, entertains and inspires. Lila is charming with how she makes the most out of all situations. She’s always willing to help out which, in one case, may get her into some trouble. I don’t want to give away any of the treasures you must uncover for yourself, so not much about the details of the story here. 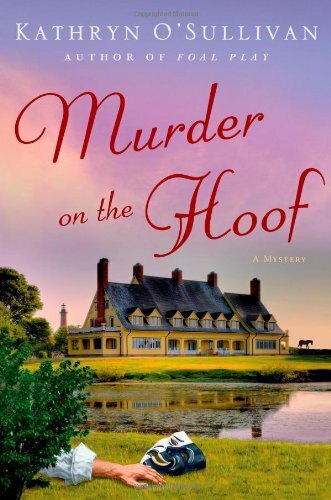 This is a murder mystery romance. It’s also an adventure, comedy and drama. Laughter, crying and anger are the emotions I experience as I read “The Collector”. Nora is very good at pulling the emotions out of me. She also writes page turners I’m unable to put down – home run with this book. 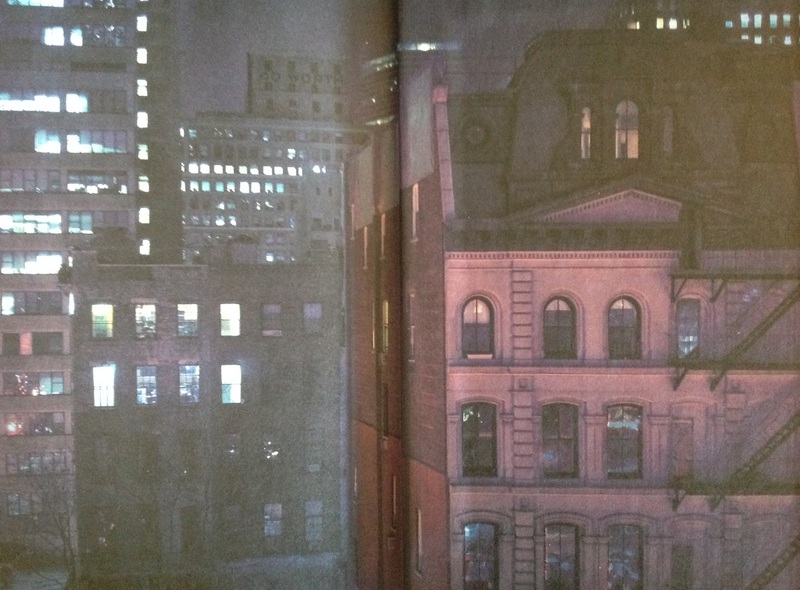 Descriptions of the settings are out of site from downtown New York – street level and a bird’s eye view from the 14th floor window – to Italy. Beautiful scenes of the people, city and rural landscape. Nora took me there for an afternoon better than any movie. Where you’ll learn all the best practices to get your signed copy anywhere in the world that mail is able to reach. Julia Whelan is an excellent narrator. Her accents and vocal artistry identified each character for me. Every inflection of Julia’s voice convey the emotions of the characters. I enjoy listening to Julia and will again I hope. Nora’s excellent dialog and seamless narratives did the rest. I hope you all find “The Collector,” as entertaining and adventurous as I do. Now I’m off to read, “Shadow Spell” by Nora Roberts. I’m loving the Cousins O’Dwyer’s trilogy so far. 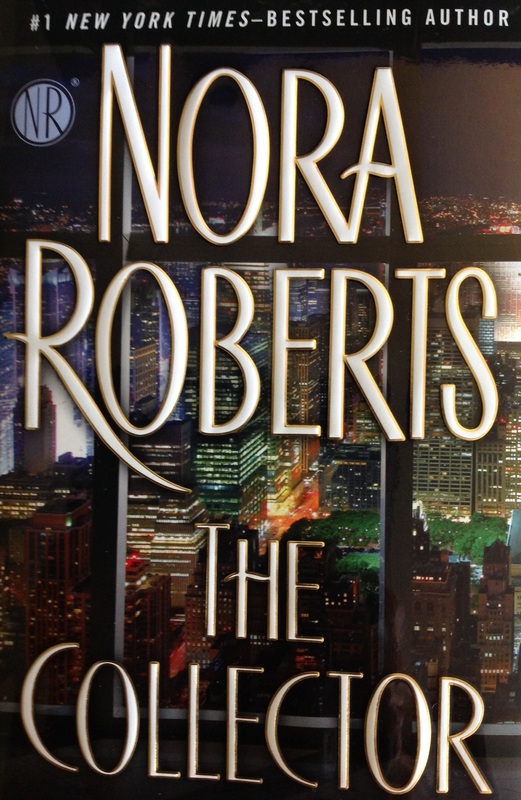 Thank you Nora Roberts for delivering with “The Collector”. Ava is in Washington DC it’s warm and humid when she’s planning for a big event at a museum. The museum her ex-lover owns which brings back the memories of the breakup. She’s also dealing with a call that says her main assistant who she relies on heavily, Adair MacLean, is missing. From beginning to end this book is mysterious and Ashley Barron does a great job blending the old romance Ava’s character had with Kader and the mystery of Adair’s disappearance. The story entitled “Ava” takes us on an adventure of intrigue and danger with many actors. 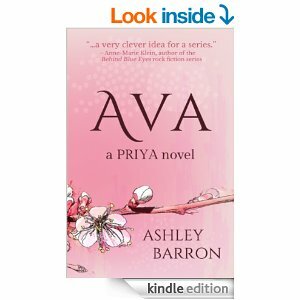 The Priya club (formed by college friends) adds depth to the tale. I enjoyed Ashley Barron’s writing style and hope to soon be able to read Bonner’s story. Jillian would like to have a baby and raise it in her family home. She has some pretty far out ideas on how to accomplish this baby’s conception. Derek a long time friend finds out that there’s something going on but not quite sure what this “Pregnancy Plan” is all about that Jillian has cooked up so he confronts her and ends up finding another alternative marrying him. In the meantime Jillian’s brother Michael would like for the house the family has to be sold so he is putting pressure on her to do that at the same time she’s trying to figure out if she’s made the right decision following through with her “Pregnancy Plan”? While Michael is planning his schemes Derek is protecting someone in the Middle East when a car bomb explodes and now he has lost memory of the mission. His brother, Jason, is fighting Jillian taking him home. The big question is will Jillian and Derek be able to make a go of it despite their families? Tina Gayle created Jillian as a strong indepentant woman knowing what she wanted and going for it. I enjoyed this lighthearted and entertaining tale. I hope that Tina keeps on writing. This book makes a great free-time read.